Locally owned, Divani, has been home to some of the most beautiful private events in Grand Rapids. Whether you need a larger venue, or a more intimate one, Divani has it all. Gallery Divani is host to some of Grand Rapids’ most extraordinary events. Whether you are planning a Corporate event, trade show, wedding, birthday celebration, or business meeting, our versatile rooms and amazing staff represent the pinnacle of West Michigan style and service. Our experienced team will help you plan and execute a flawless event. Choose Divani as your single stop for catering and event design. The largest room of the Divani collection, Gallery Divani is an 1100 square foot event space perfect for larger groups or events with a larger set up. Featuring a contemporary, urban haven with exposed brick walls, large windows and tall ceilings, you have the perfect canvas to bring your vision to life. Depending on the size and style of your event, this spacious room offers you the most options in room configurations for events of all kinds. While this room is perfect for wedding receptions and other wedding related celebrations, this pace is perfect for everything from art shows and birthday celebrations to yoga classes. The Photography Room boasts the ability to accommodate a variety of events with its size and shape. 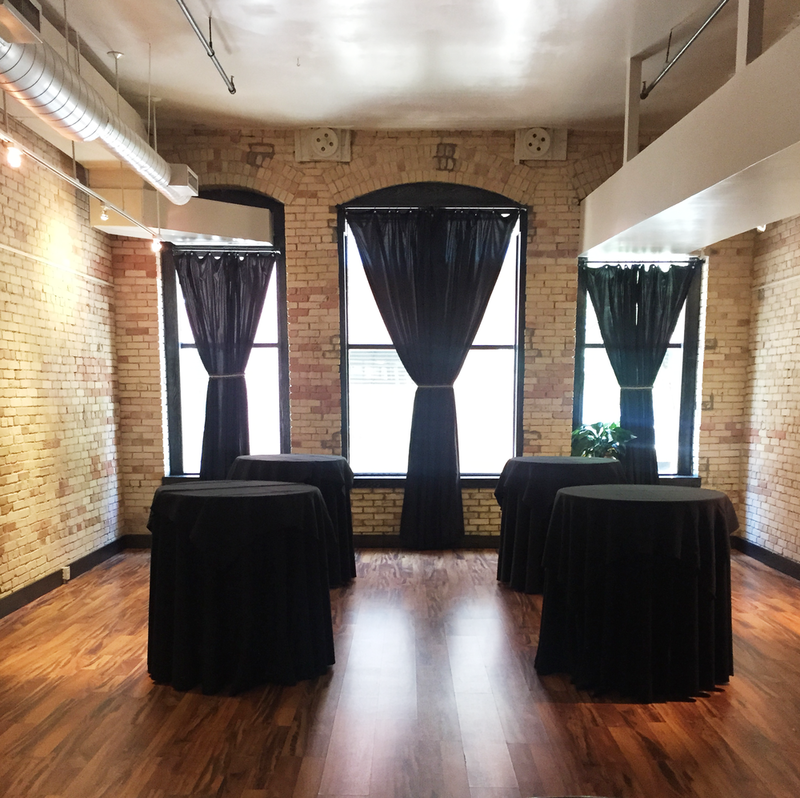 This space is 700 square feet and can be used for a variety of events including ceremonies, small parties that include the use of a bar and larger private dining events. The Photography room can also be added onto the rental of Gallery Divani for larger events that require a separate bar and seating area. This configuration can add an elegant and spacious feel to your corporate event or wedding reception by offering soft seating and a bar in the Photography Room and Dining in Gallery Divani. Perfect for an intimate dining experience, Elevated is the smallest private events space at Divani. Conveniently located just steps above the restaurant, Elevated offers seating for up to 16, well suited for business meetings, birthday celebrations, and holiday gatherings. This space can accommodate four dining configurations and an open set-up for social and networking events. Diverse service and menu options are available including hosted or cash bars. In the heart of the Grand Rapids restaurant and entertainment scene, Divani serves as the premier spot for carefully crafted cocktails, a curated wine list, beers from Michigan and beyond. Prior to 4:00 pm, Divani is available for private rental. Cocktail hour events can be booked for a three hour window with the option to extend it at an additional fee. You and your guests can enjoy everything Divani has to offer, while having the entire bar and dining area to yourselves. The space is both warm and inviting with dark wood furnishings and plush seating. Impress your event guests with the best West Michigan has to offer with a private cocktail hour in Divani.